Combine the berries with 3 tablespoons sugar and refrigerate while juices develop, at least 30 minutes. Sift together the flour, baking powder, baking soda, remaining 2 tablespoons sugar, and salt in a medium bowl. Add heavy cream and mix until just combined. Using a scoop, scoop mixture and place on a parchment lined baking sheet and bake until golden, 18 to 20 minutes. Remove shortcakes from baking sheet and place on a rack to cool slightly. Split each piece in half horizontally. 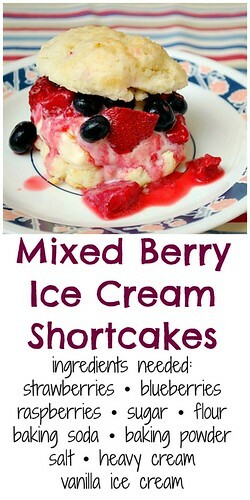 Place a heaping scoop of vanilla ice cream on the bottoms of the shortcakes. Spoon some of the berries with their juice on top of ice cream. 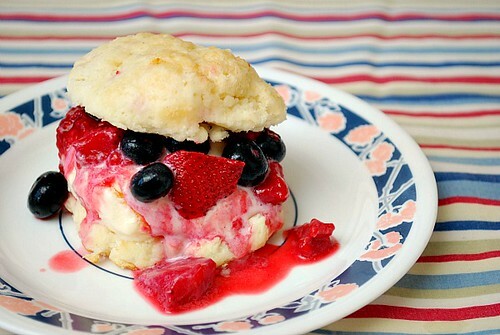 Top with other half of shortcake and serve. We never had shortcakes before (or maybe we did but called them differently so we don'r realize it). But at least your depiction of them looks wonderful. :) Maybe we'll try it.